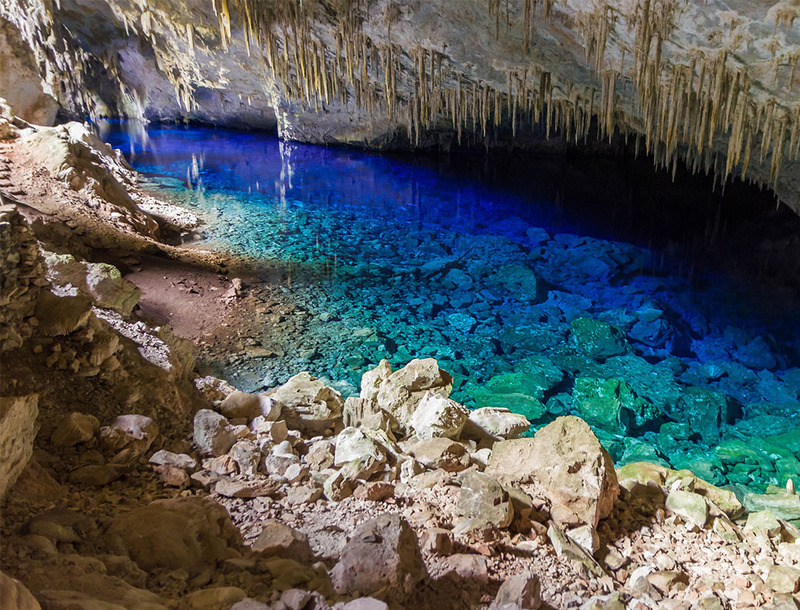 Situated in the nature lover’s paradise of Bonito, Gruta do Lago Azul is a small underground cavern complete with stalactites and stalagmites and the most piercing blue water you’ve ever seen. The cave itself went unnoticed for thousands of years until its discovery in 1924. The crystal clear cave waters turn a vibrant blue when sunlight shines through a hole at the cave’s ceiling and refracts through the water’s surface. Aside from the astonishing azure colour of the water, what makes the cave truly special is that the bottom is filled with thousands of prehistoric mammal bones from the Pleistocene era like Sabre tooth tigers and giant sloths. The cave itself boasts immense natural beauty and its contents highlight the history of this remarkable region of Brazil. Home to incredible wildlife including Jaguars and maned wolves, the unsuspecting termites create one of the most unique sights in the world. Reaching heights of up to 7 metres; the mounds serve not only as a as a home for millions of termites, but also as a nesting site for the Buff-Breasted Paradise-Kingfisher as well as a home for hundreds of Pyrophorus beetle larvae. The beetles are the ones that create the spectacular glow, making the mounds look like glittering Christmas trees at night. The Pyrophorus nyctophanus beetle (Headlight Beetle) is bioluminescent as an adult, but the larvae display the brightest light. Adult beetles lay their eggs in the sides of termite mounds and when they hatch, their luminous glow creates the spectacle. While adult beetles only eat plants, the larvae are carnivorous and unsuspecting termites are a favourite food. Their bright light only lures them as well as other insects. At the foot of the Corcovado in Jardim Botanico is where you’ll find the Public Park and mansion: Parque Lage. Completely off the beaten track and far away from tourist masses, Parque Lage is a residence turned Art School. During the 1960s, the land became a public park and walking trails were instated throughout the subtropical forests of Tijuca National Park surrounding the mansion. The grounds also include old stables, a mysterious cave, a castle-like tower and a massive aquarium. While Parque Lage has been featured in music videos for Pharell Williams, Snoop Dogg, and the Black Eyed Peas, its out of the way location keeps it just out of reach for most tourists. Once an inhabited village; Old Petrolandia is now almost completely submerged underwater. Most of town was moved after the building of a hydroelectric dam, but the only visible remanent of the village still stands tall; the arched gothic dome of a church, rising just above water level. Hydroelectric dams aren’t exactly on everyone’s bucket list; put that aside and see the main attraction, the church; spectacular in its beauty standing tall in a completely submerged village. Near the Chapada dos Veadeiros National Park in Goiás, lies the unearthly rock formation known as the Vale da Lua. A spellbinding formation of hollows and cavities create a landscape almost resembling the moon; hence the name.